Az Zawiyah (لزاوية الغربية‎) is one of Libya's larger cities at around 200,000, and home to one of its two most important oil refineries [wikipedia]. Just 30 miles from Tripoli's gate, it was the closest of the cities that briefly fell to rebel forces in late February, and in that regard the greatest threat. It was sternly re-taken in early March, and has remained in government hands since (not for a lack of rebel attempts to re-take it). The mainstream media's collective account of the initial uprising in Az Zawiyah seems to be missing some key parts. By and large, the western narrative only picks up with any interest on the government threat in early March. Before then it was just another city that rightly came into rebel hands by the magic of Arab Spring idealism, and witnessed a golden age of freedom and peace before the re-conquest. The insurgency in [az Zawiyah...] was planned and co-ordinated, and was neither peaceful nor spontaneous from the outset. The ‘active’ demonstrators were only about 300-500, the majority Libyans - amongst them a number returned from abroad - but also according to the Police, Tunisians and Egyptians. From the start of the events, they entered the town and centre, taking hostage some of the citizens with them. During the three weeks [that the town was controlled by the rebels], all public buildings were pillaged and set on fire. . . . Everywhere, there was destruction and pillaging (of arms, money, archives). There was no trace of combat, which confirms the testimony of the police [who claim to have received orders not to intervene]. . . . There were also atrocities committed (women who were raped, and some police officers who were killed), as well as civilian victims during these three weeks. . . . The victims were killed in the manner of the Algerian GIA [Armed Islamic Group]: throats cut, eyes gauged out, arms and legs cut off, sometimes the bodies were burned . . . I haven't seen much to confirm the worst of that, nor to rule it out. Another video shows locals speaking in April with CCTV reporters about the arson and mayhem under rebel occupation, partly confirming the French mission. It was, as we'll see, an ugly time. For comparison, here is a splendid video of the city in peacetime. This has a few useful views in establishing where later videos occur, but mostly serves to show what was there before the rebels started a war in late February (if az Zawiyah followed the general pattern across Libya). Another and more cynical view of Zawiyah after its re-conquest by the authorities was found there by the team from Sky News. They were allowed the film there, and showed wounded buildings (all by Gaddafi's mortars and rockets), draped again in green flags, healing green streamers, and portraits of col. Gaddafi to show the city's acceptance of his rule. A small group of a few dozen pro-government demonstrators wass shown, but the correspondent/narrator, Stewart Ramsey, said in his low, grave, unamused tone: "There are 200,000 people in Zawiya. We're not convinced this dozen [sic] actually come from the town itself." Ramsey focused on the mosque used as a headquarters by the insurgents, later demolished by the government, and the graves of the fighting's victims in the central garden, later dug up. While Zawiyah might seem happy to be past the troubles, beneath it, the government was "trying to erase history in this place." And for a taste of the uncertainty over how that deadly conflict began, consider the Wikipedia entry for "the battle of Az Zawiyah." It says the "battle," which didn't end 'til about March 10, "began on 24 February, when Libyan troops loyal to Gaddafi attacked a mosque where protesters were holding an anti-government sit-in." Protesters simply communicating their desire for change, as opposed to actually overthrowing, met with brute force. A familiar story. Militiamen and pro-Gadhafi troops were repelled Thursday when they launched attacks trying to take back opposition-held territory in Zawiya and Misrata, near the capital, in fighting that killed at least 30 people. In Az Zawiya, 40 km west of Tripoli army bases and ammunition depots were attacked early morning, and security forces were caught off guard. Attackers brought light and medium arms and tanks into the square of the city, and the number of people in the square rapidly increased. More tanks and anti-aircraft [weapons] were brought in. [a number of them are shown being admired and played with]. They began distributing weapons in a manner that would enable them to challenge any incomer. The cover of the tanks’ cannons demonstrate that they were never used before. [shown for a tank and an apparent anti-aircraft gun]. The video displays that the inhabitants of the city were behaving casually in the absence of security forces or soldiers. The following day, armed rebels began digging trenches, and the square was turned into a heavily armed fortress, with the contribution of Libyans and foreigners. [A man is shown holding aloft what looks like a large bar of gold - looted?]. A decent quality video is shown for the digging-in segment, which I used to double-check if this could be pegged to Az Zawiyah. Indeed, I could find the central square and it's a perfect match for the screen grab at upper left, using the pivotal mosque (which is actually no longer there - see this post). The view is roughly south, towards the the central park, a tree-and-fountain-filled awesome little place. The "protesters" had become well armed somehow, and clearly by the end of February at the latest had come into control of the city, requiring - really, requiring - a government response. Those questions - when and how certain people of az Zawiya came to hold the city and to be an army, will be found in the events of the second half of February. I will draw on the Wiki, a few other sources, and a lot of direct evidence - online videos of the day's events themselves. Like most, I can't understand Arabic, so my observations of some redordings (especially the ones with addresses and sermons) will miss valuable clues about what was happening between the scenes, and maybe behind them. The earliest protests I can find are on the night of the 18th, already three days into the national uprising. This is shown in a Youtube video, and at least one other. (and another gives the same as Feb 19, but I'm going with that one forgetting time zones) There is chanting in the center of town at night, and a few kids loudly striking with metal implements at a 12-foot high metal-framed picture of Gaddafi. The second video has an edit just as something kills their vibe, cuts back to brief chanting again, some other unclear noises, and then cuts for good as they start to disperse. Protests are shown again on February 20, again at night, and in a different, more permanent mood. They're camped out, not dispersing. There's lively chanting, mellow fires of the toasting marshmallows kind. Many children are present, and it seems pretty nice. But earlier in the day, a building (described somewhere as a hotel) is already burnt and belching smoke, as seen at left, the ground littered with debris (one view, and another closer-up, with redable Graffiti and someone shouting on a public address system. Sky News would later pass this rebel vandalism/terrorism off as strictly government rocket and mortar damage. Feb 21-23 shows a strange absence of shared footage or news that I've been able to find. What happened in Az Zawiyah those days? It can't likely be a massacre of protesters, or anything remotely like it, or we'd have seen and heard about it. The battle began on 24 February, when Libyan troops loyal to Gaddafi attacked a mosque where protesters were holding an anti-government sit-in. The troops opened fire with automatic weapons and hit the minaret with an anti-aircraft gun. After the attack, thousands of people rallied in Martyrs' Square by the mosque shouting “Leave! Leave!” On the same day, anti-Gaddafi forces repelled the attack on the city. Zawiya – as we reported earlier army units and militiamen loyal to Muammar Gaddafi attacked a mosque where protesters were holding an anti-government sit-in. Ten people were killed and around 150 wounded, according to a doctor there. Rebels had been camped at Souq mosque for days. Soldiers opened fire with automatic weapons and hit the minaret with an anti-aircraft gun, a witness said. That report was coupled with the photo inset at left, possibly from the same town and same day, or earlier yet, showing rebels driving at least one tank already. They also held plenty of machine guns at least by this time. So the peaceful protesters camped out at the square were either already armed as they came under attack in their "sit-in" on the 24th, or managed to get armed quickly despite the injuries and deaths incurred in the brutal offensive that then just faded away and let their weapons go. One dead and bloodied rebel is shown in that video, carried among them as they came back. Obviously he was the one who was just sitting there protesting, and not on a weapons raid to a base outside town. More weapons can be seen in this view of apparently the same procession - at least one grenade launcher amongs the rifles, swords, hatchets, clubs, and fists. There's smoke in background. At another point in the day, an apparent firefight occurred at the square, with one wounded carried back to the semi-sheltered area the camera was. As usual, the enemy is never seen, and no one else seems terribly worried, many standing fully exposed in the street for no clear reason. At another point (mid-late afternoon), a shrill and emotion-filled sermon with heavy use of "shabab" (youth) is delivered in the central garden. A video posted February 25 shows captive government soldiers ("mercenaries" - see the idiotic description): one black man laying dead (head-shot, see right, and below) and others of Arab complexion injured, tended to and filmed in a makeshift rebel hospital. This suggests the local hospital staff hadn't defected, as was the case in Misrata and Benghazi. Bad sign - the city was not theirs, only the square and certain homes and such. Also, is it just me, or does it look like the dead soldier - the black one - was injured in the hand and/or upper body, bandaged up, then shot again in the head? And what is that, a business card inserted? The same day - early afternoon - a smaller number of rebels not armed at the moment that I see were recorded at the burial of the previous day's dead, again in the central garden. After a short and fiery sermon from the Imam, they march out to make more martyrs, shouting "Allahu Akbar!" No security forces are yet seen, but they must be out there. The building burnt on the 20th is again visible here. The 25th has video of a march, a stationary gathering, smoke in the background, and a night rally. No repression shown, nor detailed notes yet. Recalling the CIRET-AVT/CF2R report of citizens taken hostage, one video of the 25th is of interest: Mercenaries in Zawia: (click "Kadin" to view). I'm not sure what the hell's going on here - the mercenaries may be the guys at the video's end, in a small trashed room in the mosque compound. On 26 February, government forces opened fire on anti-government protesters and Egyptian migrant workers. By this point, most of the city was under rebel control — however, security forces controlled surrounding areas and had set up checkpoints on the outskirts. In addition, some government militia and security forces were still present in the city and at least one tank was seen. 24 rebel fighters were killed during the two previous days of fighting. On Feb 27, the video posting says, heavy weaponry was on display - tanks and anti-aircraft guns. Another video that might be the same day. This looks like the arms bazaar Goheda showed, and nothing earlier really does. Half an army seems to have passed through and just left their stuff. Another video of Feb 27 shows an aggressive still rally, with hundreds holding aloft weapons - swords, clubs, hunting rifles, strictly. All professional gear - that perhaps acquired the same day, and that held for days already, is kept from view. Another is the same, protesters raising swords, sticks, and an axe. Coincidence, or coordination? The same day, according a LiveLeak video posting, "Libyan youths close the last regime outpost" in the city. A crowd of young men in a building complex are chanting aggressively and throwing rocks at one of the buildings. A door and other debris litter the ground, and at least three cars and a pickup truck are burning fiercely. At the end, semi-automatic gunfire is heard popping just as the video cuts. That the video ends there supports my guess is it was from the rebel side. On 28 February, government troops conducted a counter-attack against the city with 200 soldiers coming in from the east, supported by snipers, tanks and artillery. The first attack came just after midnight when loyalist soldiers tried to come through the eastern city gate in pick-up trucks. The attack was repelled. In the early evening, a second attack of three more trucks tried to break through the west gate. Two of the trucks were destroyed. At the same time, six more pick-ups again attacked the eastern gate. Two were captured by rebel forces. During the clashes one government tank was damaged by a rocket propelled grenade. After six hours of fighting, government troops were unable to reclaim the city. 10 soldiers were killed in the street fighting and 12–14 were captured, of which eight switched sides and joined the rebels. The video record, as far as I've seen, shows none of that, nor even the aftermath. All that I've noticed is victory celebrations. In the daylight hours, we see jubilant crowds under the new/old (monarchist) flag, showing their temporary freedom from Gaddafi in a nicely varied video. An overview of the main square, looking south to the central garden area, shows one tank among the crowd, described elsewhere as "Captured," in the government-led fighting against the city. Just where their other tanks and arsenal were parked isn't clear. At night on the 28th, after the alleged second wave attack, a massive crowd fills the square, waving the flag. A child is held aloft in the crowded square shouting Allahu Akbar! Four days into the "battle" and it seems unquestionably won, with only the furtive or overpowered attacks described above - allegedly - slowing them down a little. It would be a few more days before the battle started afresh, now that the rebels had set it up by stealing another city. but question is "What can be done to save human live in Libya, Syria and Afghanistan as well as Iraq :"
Thanks for the comment, and I reciprocated there. Good thoughts. Why can't those even seem to cross the mind of world leaders (including Mr. Gaddafi)? but replace the + with a < , remove all spaces inside the < > brackets after the the "e" in href. Inside the quotes, your url, between the > and closing </, you put the words. Cool, and it occurs to me maybe you already know this and didn't do it because it's a slight pain. Not as bad as trying to explain it ... Okay, I'm outta here. This youtube video was uploaded on 29 May, but probably releates to much earlier. Pretty gruesome - throats cut?? There is a good quality video from JeelLibya, uploaded 1 March 2011,entitled أداء الصلاة في الزاوية المحررة - السبت 26/02/11 - Prayers on Saturday,26 February in Liberated Al Zawiya, which shows an undamaged mosque and central square with the new flag flying, but pans round to the burnt out hotel building at the end. Another video shows the demolition of the minaret, the last vestige of the mosque, uploaded 5 April ,allegedly found on a dead Government soldier in Misrata (can you believe that?)! The Minaret was certainly DOES NOT SEEM TO HAVE BEEN HIT by an anti-aircraft gun on the 24th Feb. There is YouTube footage of what looks like a smoke bomb going off in the minaret somewhere on YouTube (lost it)with no damage... A later video from after the rebel takeover unfortunatly undated, uploaded by 17022011libya on 13 July shows the damaged minaret and mosque walls with graffiti, entitled من داخل ميدان الشهداء بمدينة الزاوية في بداية الاحداث (beginning of events in Az Zawiya) However, the last video is important because it places the action this rebel "action" in Az Zawiya within this mosque. In any case, the Sipitchu video is only uploaded on 14 May and doesn't really show anything concrete,just a bit of applied blood,people who don't know which leg to hop on,etc, and gunfire is probably dubbed. Outside seems quite normal. Finally, at 1.00 in another late loaded video by mocuarch,1 July, one sees the large building with rebel flag down the wall being blown up - it is definitely an explosion from inside, the wall is blown out. The mosque and minaret remain intact. Were they also blown up? The battles are mocked up. Interesting footage nevertheless. 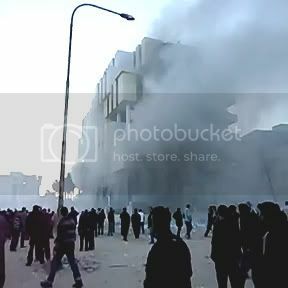 Here is the ridiculous footage of the minaret of the mosque at Zawiya coming under attack., uploaded by freelibyan only on 6 October 2011, 6 months after the alleged incident. Looks like a smoke bomb. 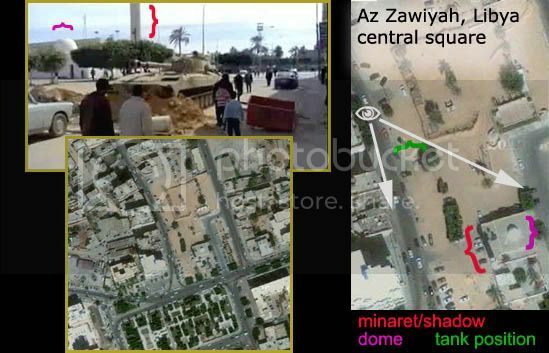 However, footage showing real damage to the dome and minaret was uploaded on March 11 by VoiceOfShia14 :تعرض احد مساجد مدينة الزاوية للقصف - Showing effects of some kind of attack on Az Zawiya mosque - th minaret is damaged, top lost and the dome has caved in. BTW the minaret does have bullet holes in it in that other video. As for this one . yea . shelling . Forget war crime, isn't using a mosque to create lies and fakery to falsely invoke religious furor a wee bit sacreligious? By the way, this is odd. "Muammar Gaddafi infidel, criminal, and a mosque was bombed [az Zawiya]] 6311"
March 6 was the last days of closing in on the square that contituted "free azZawiya" We can see it's still just fine after two alleged attacks. One shows intention to have Gaddafi people attacking the mosque for propaganda in the Muslim world. Noted. However, that other video is sobering. That place was damaged by the 11th. I wasn't even clear on that before. If fighters were using it as a base, it might make enough sense to clobber it and chase them out. It might also make enough sense to the other side, for the PR value, to fake it for real with some of what they did control there: a bunch of stolen heavy weapons. When people see things blown up, they tend to forget everyone was capable of that by this point, and one side (not the one most think) was crazy as hell. showing Gaddafi troops in a destroyed Zawiya allegedly on 5 March 2011. Comments say this is Faroukh Army of Gaddafi . Soundtrack perhaps dubbed. كتيبة اللواءالخويلدي الحميدي والمهدي العربي تهاجم الثوارفي ميدان الشهداء بالزاوية , Batallion Major General Khweldi Hamidi Al Mehdi Al Arabi attack Rebels in Martyrs Square, Az Zawiya. There is an RT news clip, Uploaded by Russia Today on 28 February, with the amusing title for the date,Gaddafi loses Libya: Tripoli last target of opposition in which Peter Oliver reports from Cairo, with photos of Az Zawiyah from about 0.41 onwards. Notice the undamaged minaret of the mosque at 0.44 in the background. The footage, is undated shows rebels in control in Zawiyah until about 1.05 and again from 1.54, with a burnt out ?police? building at 2.19. See especially the Skynews video , Battle for Zawiyah - Alex Crawford reports,uploaded 9 March 2011. The current google map shows no trace now of any structure. The next image of Zawiyah was collected on 14 March by the WorldView-2 satellite, and indicates the mosque had been razed and the property largely swept clean by that date. commonly used by combatants in the Libyan conflict are visible in the immediate vicinity of Martyr's Square and the mosque, and two dump trucks as well as a possible front-end loader and cement truck are visible directly adjacent to where the mosque had been. A higher-quality image from 20 March clearly shows the absence of the mosque as well as proximate heavy equipment. martyr square next morning @ 9.46 , muezzin calls for prayer from mosque? 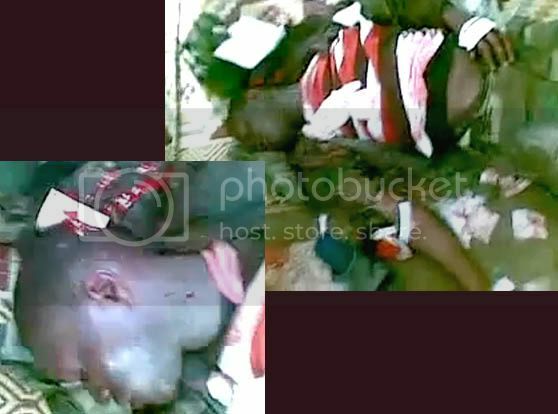 At frame 8:08, you can see two dead mercenaries and one person shouts "these ones (mercenaries) are from Nigeria... Nigeria." When I arrived, the first journalist to enter after the fighting ended, the streets were almost deserted for half a mile in every direction beyond the main square. The minaret of the mosque, perhaps once 100 feet high, has been shorn in two, the top now a mess of mangled concrete. Dozens were killed in the battle for Martyrs' Square. There are now many more "martyrs" buried there. blackened tanks being loaded on to transporters; militia vehicles burned and peppered with bullet holes; the clothing of the newly dead, shot in a battle in Gaddafi's backyard. like the BBC team who tried to get into Zawiya earlier in the week. They suffered mock executions and a night in a cell amid the screams of tortured detainees before they were eventually freed." March 11, 2011 The old man said the armed insurgents were not from the city but from outside. "I was not scared for myself, but for my children." He also confirmed that the country is receiving a UN humanitarian aid committee next week to review the situation in Libya. Great Man-Made River, Being Undone by Men? Video Study: Benghazi Hardhat "Mercenaries"
A Neat Trade for Libyans?